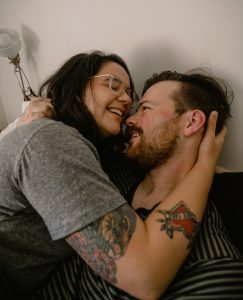 An in-home couples session in Portland, Oregon with two really loved up humans. I can’t make this up guys! These two couldn’t get enough from each other, and it made it all the more hilarious that there were around ten of us snapping away with photos! As part of the Inside Workshop (cliccckkkk ittt) with Laurken, we got in close, we worked inside with real couples, and Whitney & Cory glowed the entire time. Yeah, probably because our gal Laurken can get pretty dirty (it’s a good quality I promise) and with that, she can make an entire room be confident in whatever they want to do! No one’s gonna be awkward with her and we relished in the atmosphere! Think you wanna see more after this? Look no further: Lauren and Gavin got to be surrounded by us photographers too. I think we might have scarred them. Scarred them with hilariously loud cackles and energized people. Yeah, I know I gotta stop trying to be funny. This experience helped me break out of my shell. I’ve never taken a leap like this and even now I’m not sure what held me back. Location? Gear? Money? Doubt? Honestly, if there’s not a clear answer it comes down to you. What are you going to do next that will make you realize you can do it all? What is missing that you can’t reach? No, but seriously, look at these photos. Look at how much Cory loves Whitney. I love that I can feel it and hope you feel the same! If you think an in-home session with you and your loved one could be awesome together, you should send a message. do it. no regrets.